Bummer on the deadlift, I put on two 5#'s when I should have put on two 10#'s, so today was supposed to be 265# but after the lift I realized I had only done 255#. The "H,H" in pullups means two heavy Walmart resistance tubes. The only way I can figure to get fixed-width font is to use the "code" tag,but it puts everything in that pale green color. I have never really bothered to write down warm-ups, but I might start just out of curiosity. Note: experimented with very skimpy warmup, trying to get a strong feel from experience how the warmup sequence affects the sets. First set was quite shaky. Next time will do lots of warmups and compare. Last set rather slow, definitely getting tired out, but have avoided my worst habit - hyperextending lower back. 265# - 1 x 5, baseball grip. Personal best for working set. 3 warmups has always worked before but I think at 260#+ I will need four warmup sets from now on. Following Mehdi's advice to stick with overhand grip as long as possible to improve grip strength, and then use baseball grip on the working set. 2 Resistance tubes: 1 heavy, 1 medium. From walmart. 5 x 8 - new working set personal best with this resistance level and wide overhand. Beginning to feel a satisfying strengthening of grip on these. Yesterday was sore for first time in quite awhile, presumably from Deadlifts the day before. This morning woke up feeling stiff and sore on left side, from lower back down through leg. Decided to let warm-ups tell if I'd be working out. Ended up doing all exercises. Mental energy was on driving with hips and preventing "squat good mornings." Effort was a success, but ended up very sore about 15 minutes after workout. That has not happened in a long time. One of those times you feel like you've done it for the first time. Note: slight soreness in left lower back had no effect on squats at all. Slight soreness in left side got serious after each set. Get this: on the outside of my lower left leg. Go figure. Slight soreness in left lower back a minor irritation, also outside of lower left leg felt stretched. Awesome, this was my first stall point, and I deloaded to 160# about 3 weeks ago. Today made 5 smooth sets. Incrementing by only 2.5 per workout after first deload after failing at 115. Beautiful smooth set. I love the deadlift. Following advice to use overhand grip through all warmups to improve grip strength, and then use baseball grip on working set so as not risk missing it over grip strength. Had to skip it, guests were already arriving, just did a set of 15 tri pushups for the fun of it and packed it in. General note: with regular stronglifts progression, none of the exercises are easy anymore. Workouts are an exertion for all exercises now. Woohoo! New PR for working set. I'm in the 200 club. After 3rd set felt like I'd been whacked across the behind with a metal pipe. One additional whack per set after that. Last edited by KenDowns on Thu Jun 23, 2011 9:58 pm, edited 1 time in total. Once again after 3rd set felt like I'd been whacked across the behind with a metal pipe. Soreness in glutes continues as I write this a few hours later. Quoting mark74: "StrongLifts as all linear programs is relatively easy until you hit a certain point, then it becomes progressively challenging up until it's positively brutal." * Did 5 reps on set 2 but my spotter said, "my back hurt just watching that," so I'm not counting it. Learned a lot today. That bad rep put a load onto my lower back, so it is a bit sore, but does not feel injured -- more like DOMS and I expect it to go away. On the bright side I'm getting a very strong feel for when I have one in the tank on squats and don't anticipate doing that to myself again. The stronglifts playbook says to try again @210 before deloading, but I'm going to deviate and deload to 175 and resume. At next stall I would go to 3x5 on squats. * This was odd. I pull two reps and completely collapse on 3rd. Scratching my head as we switch the weights for my partner's set I realize we loaded 20 extra pounds for my set! Decided to count it as set 3, and if I could finish the 5x5 we'd go on as normal. Decided to go w/2.5 increments hoping to go longer before stalling. Rep 5 got slower and slower with each set, but no form breakdowns. Woohoo! New PR for working set on rows. Have never been able to get past 115 before. Doing the 2.5 increments seems to help. 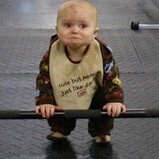 Todays theme: I'm getting sick of these 5x5 squats every session! Jumped by 5 this time. Will go up 2.5 next time. Spotter says it was sloppy, and I agreed, it felt sloppy. Milestone: that's the end of my Sears 300lb weight set, time to buy more plates. Have been searching Craigslist. If I can't find on Craigslist, the cheapest way to get more plates seems to be to buy a 2nd set, 35# bar + 265# of plates. Decided to break routine and go for some maxes. Training partner says that I kept a straight back to the bottom, but as I began to lift I would hyper-extend my lower back at the start and the return to straight at top. This probably explains my sore lower back today. That's my next form item to work on for squats. Spotter says I was extending hips and knees at start, instead of just knees, so that's my next thing to work on for deadlifts. Once again we misloaded the plates, set 4 was actually 160.